On Thursday 12 February 2015, GCU London was represented at the Chartered Insurance Institute (CII) Public Interest Awards 2015 by Risk Management Programme Leader, Dr Madhu Acharyya. Dr Acharyya was a nominee in the ‘Promoting the Profession’ award category at the ceremony at East Wintergarden in London’s Canary Wharf. 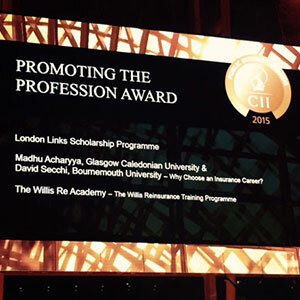 Dr Acharyya was recognised for his research article entitled ‘Why choose an insurance career? A pilot study of university students’ preferences regarding the insurance profession’. The study found that students are unaware of the basic philosophy of insurance businesses, their products and their vital role in the economic and social system. Unfortunately, Dr Acharyya narrowly missed out on the award to ‘London Links’ for their scholarship programme. However, as one of the only nominees who wasn’t an industry professional, it was a fantastic achievement to be recognised for his work in ‘Promoting the Profession’. The awards ceremony was well attended, and GCU’s table contained a very interesting set of alumni, industry specialists and team members. One of the best known financial journalists and presenter, Adam Shaw, also played host to the awards. GCU London’s Dean, Dr Linda Amrane-Cooper, was full of praise for Dr Acharyya, “I wanted to congratulate Dr Acharyya on the terrific achievement of being short listed for the CII Public Interest Award. “As the presenter went through the different awards last night and the short listed nominees, it became very clear just what an achievement it was that Dr Acharyya was short listed. Dr Acharyya and his co-author (David Secchi, Bournemouth University), were the only non-industry nominees in any category (other than the public voice category) – this is a significant achievement. “It is obvious that Dr Acharyya’s voice is valued right in the heart of the Insurance and Risk industry. It was disappointing that one of the other nominees in the category was selected as the winner, but I don’t feel this detracts from the significance of his work.” We’d like to join Dr Amrane-Cooper in congratulating Dr Acharyya for being nominated for this award and thank him for engaging in this work. To find out more about Dr Acharyya’s study, please visit Palgrave Macmillan.